to provide exactly what you are looking for. You are looking for a tool enabling you to perform searches and monitoring simply and independently. You are looking for a platform enabling you to perform professional monitoring and share the results. You are looking for a platform enabling you to centralise and harness the strategic information and entrust tasks to your experts. You are looking for a secure Business Intelligence platform enabling you to centralise, harness and analyse all the strategic information relating to your innovation. Are you a monitoring specialist looking for a tool enabling you to perform searches and monitoring simply and independently? Thanks to its PatFinder module, RAPID enables you to run searches in the European Patent Office’s document bank (DocDB), as you would do on Espacenet, except that we secure the entire process for guaranteed confidentiality. In addition, you can classify the results of your searches in directories, annotate them, export them in report form and even convert them into automatic monitoring. Our Single user service gives you access to a professional tool at an affordable price. The PatFinder module enables you to carry out patent searches in complete security, and then convert them into automatic monitoring campaigns. The monitoring module enables you to keep abreast of the new patents corresponding to your searches. Our single user subscription package includes hosting in our secure cloud and single user access. You are a small monitoring team that wants to set up professional monitoring and share the results simply: with its cloud hosting not requiring any installation on your workstations and its intuitive interface, RAPID is perfectly suited to teamwork. Every staff member can access the content for which they are responsible, and share their monitoring results with the other users. 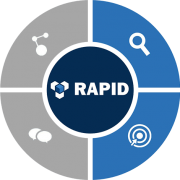 RAPID can send you monitoring results of patents and publications derived from commercial databases, ensuring efficient and professional monitoring. 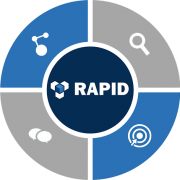 RAPID is a modular tool. That means that if a subscription package does not fully meet your needs, you have the option at any time of adding the missing elements. For further information about this, please do not hesitate to contact us. The monitoring module gives you access to patents and/or publications exctracted from professional sources. User management and creating distinct monitoring themes enables you to give everyone the most relevant information. Our basic small team subscription package includes hosting in our secure cloud, 5 monitoring subjects and 5 access codes. 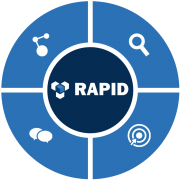 You are a company that wants to set up a strategic information centralisation, dissemination and processing system: RAPID is a single tool able to collect external and internal information, organise and process it, while guaranteeing an optimum security level. 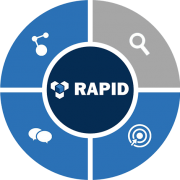 Used for more than 10 years by renowned companies such as Nestlé, Essilor or Scott, the RAPID platform features a collaboration module used to set up information flows and analysis formulae for collecting and centralising the opinions of your experts. New to version 4, the dashboard provides you with total control over your platform’s content. The Monitoring module lets you collect external and internal information to be assessed by your experts. Workflow and analysis formulae ensure optimum processing of strategic information. Security is at the core of RAPID’s design. The user rights administration module give you control over the degree of information confidentiality. Our Enterprise subscription package includes hosting in our secure cloud and 50 access codes for your staff. You are a global company seeking a strategic information centralisation and sharing solution: RAPID can be a real mainstay for your Business Intelligence system, enabling you to centralise in a single tool your monitoring results and document search results, the innovation sheets of your R&D teams, the analyses of your experts, field reports by your marketing teams, and many more things besides. As this system is highly strategic, we offer several different modes of hosting. From the private cloud at our datacenter in Neuchatel to hosting on the client site, you set the rules of use for your platform. In addition, RAPID can synchronise with your company directory for easier secure access, and is able to interface with your other information systems via its web services. Give access to you team to a private and fully securized version of espacenet. The analysis module enables you to configure formulae for your experts and distribute tasks via workflows. Our basic Corporate subscription package includes hosting in a secure private cloud, with 300 access codes. It is even possible to couple access to RAPID to your company directory.